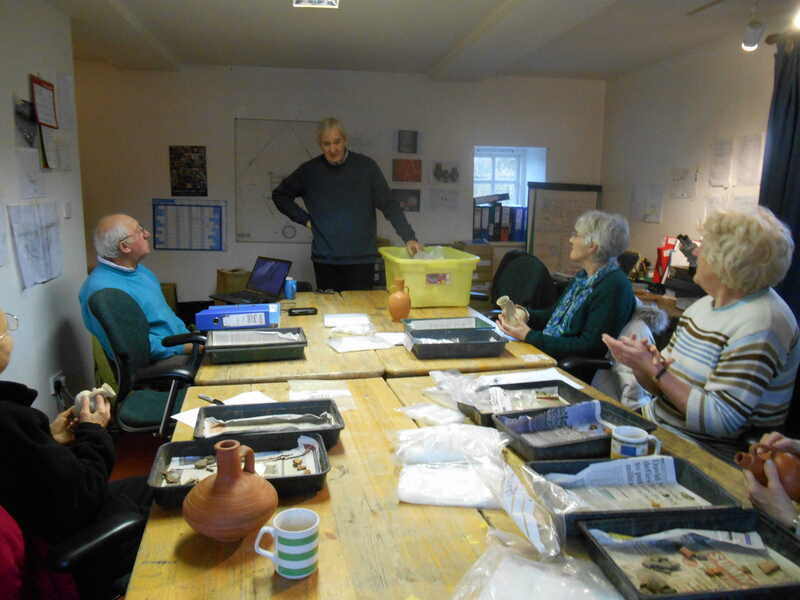 On 11 February Trevor Greer, one of our regular Trendles volunteers, gave an excellent talk and handling session on his own collection of Roman pottery to the Tuesday volunteer group. This collection included many whole vessels, plus fragments from beautifully moulded dishes depicting hunting scenes and musicians and maritime scenes. 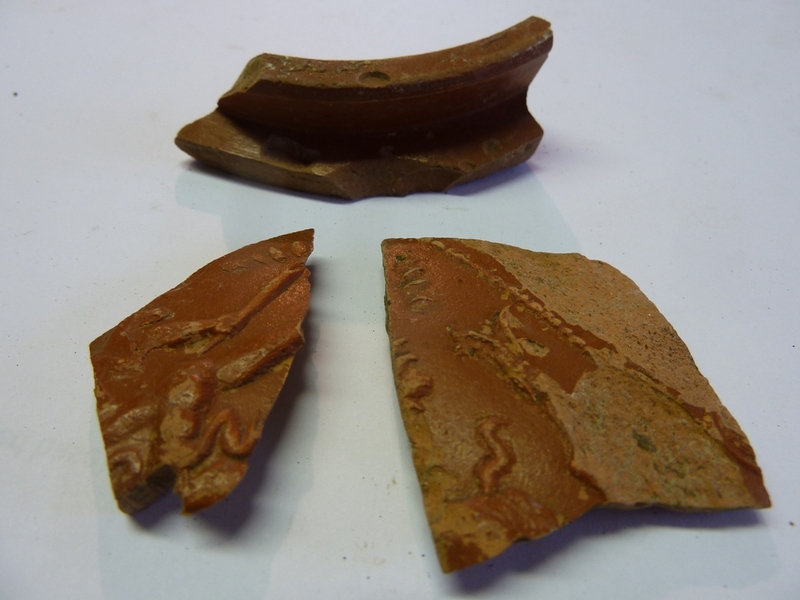 As most of the pottery we identify on the Trendles project is in the form of broken sherds, it made a nice change to handle complete vessels and imagine how they might have been used in Roman times. 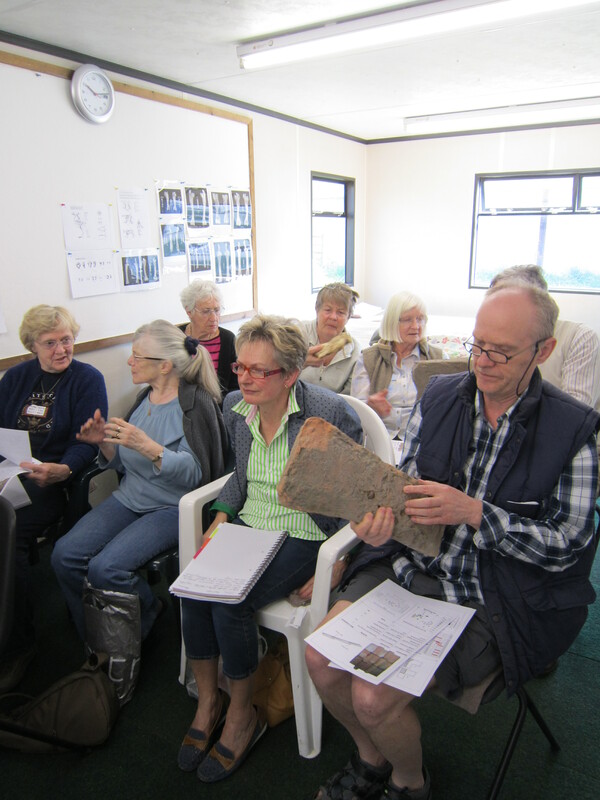 Trevor has built up an extensive knowledge of Roman pottery overs the years and explained many features to our group, such as the use of the distinctive foot-shaped potters stamp on the red-slipped Arrentine wares. 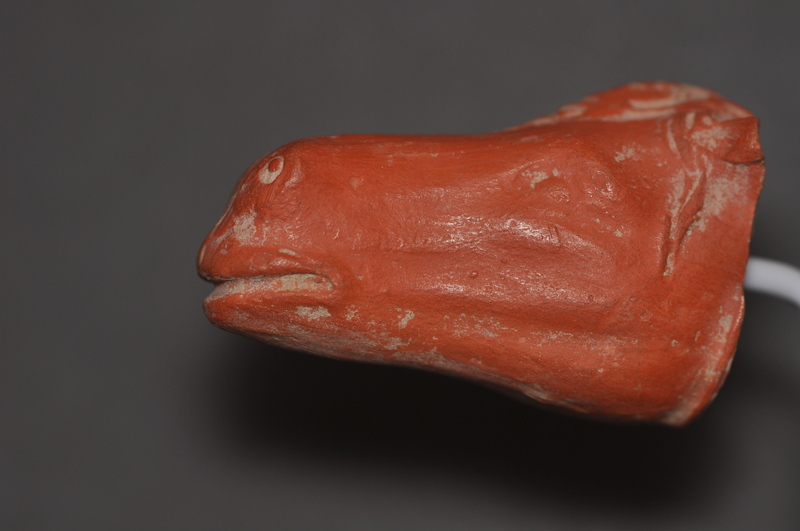 Many of the red-slipped and black-slipped ware from Roman North Africa and Italy were very similar to the Gaulish colour-coated wares we found on our site at Marcham. 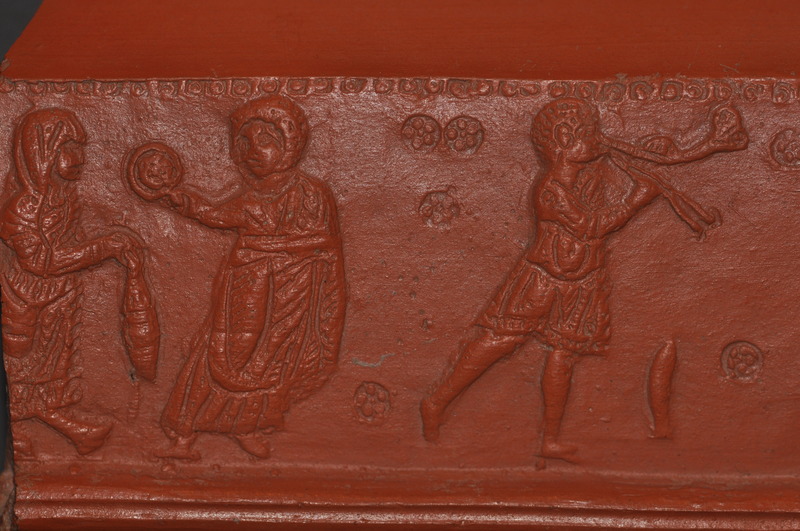 His collection included a series of decorated pottery oil lamps, and he demonstrated the evolution of the lamps from the small finely-modelled early types to the larger and simpler late Roman and Byzantine types. 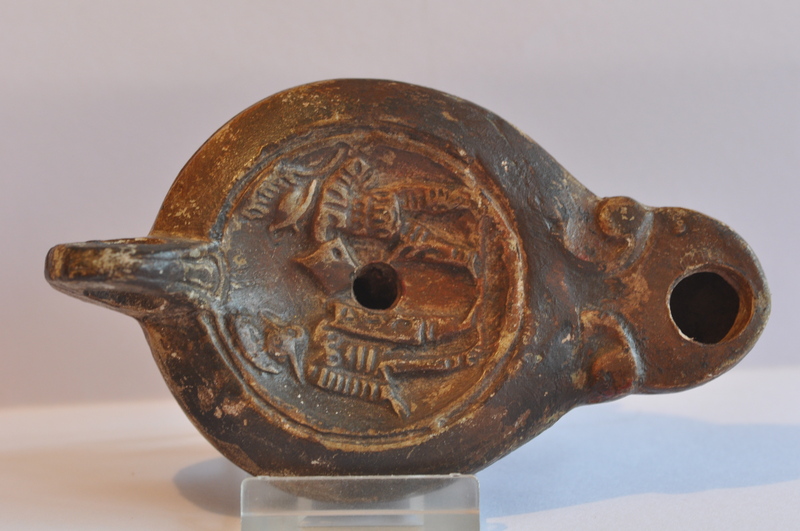 A lamp depicting fighting gladiators and another showing a lioness were particularly striking. Trevor also showed us some amazing fragments of modelled applique designs that were originally attached to expensive serving dishes. The horse head applique was beautifully made. All we needed after this ‘show-and-tell’ session of some spectacular Roman table plates and vessels was some Roman delicacies and perhaps a bottle of Italian wine to complete the ancient dining-room experience! When you tell someone that you have been digging and then that you don’t mean working in the garden, 9 times out of 10 their next question is ‘what have you found?’ Their eyes light up expecting tales of treasure or weapons with a tale to tell. What they don’t expect is that the interest lies for many in the evidence of everyday lives lived in the past. Even the dedicated digger may not enthuse over the pieces of brick and tile found on Romano British sites, the ceramic building material usually referred to as CBM, does not excite in the way pottery or bones do. 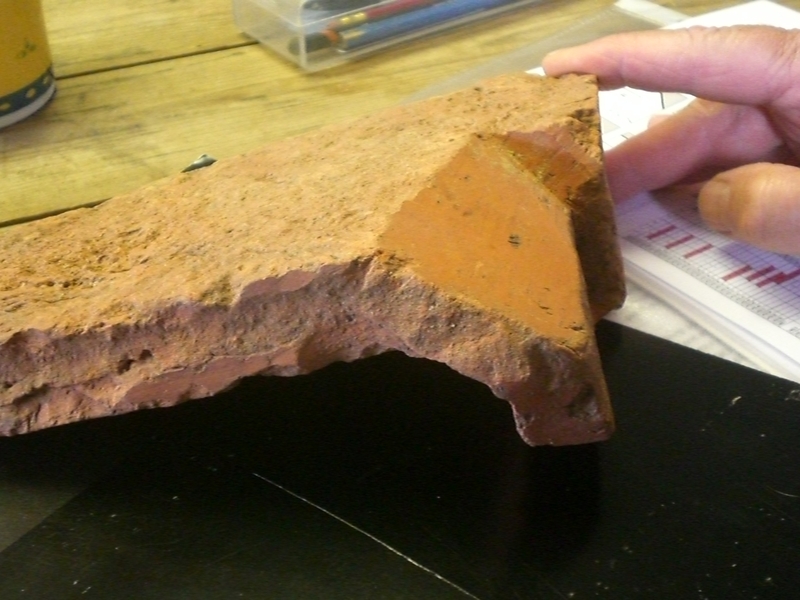 But Peter Warry has changed that for Roman roof tiles. His detailed studies show the changing shape of the cut aways, the shaping where tiles overlap, has changed over time establishing the date of building and the phasing of sites. This has contributed to research on sites all over England and into Scotland. The tiles were made in wooden moulds as they were large and the wet clay heavy to handle. Where the maker has pressed the clay down in the angle in the mould he sometimes used his thumb or otherwise two fingers. This was one of the most interesting and informative talks I have heard recently. 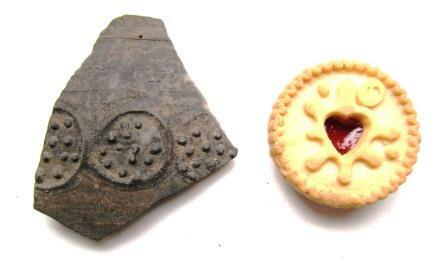 – looking for the delicious sounding ‘raspberry roundels’ in our Marcham pottery assemblage. 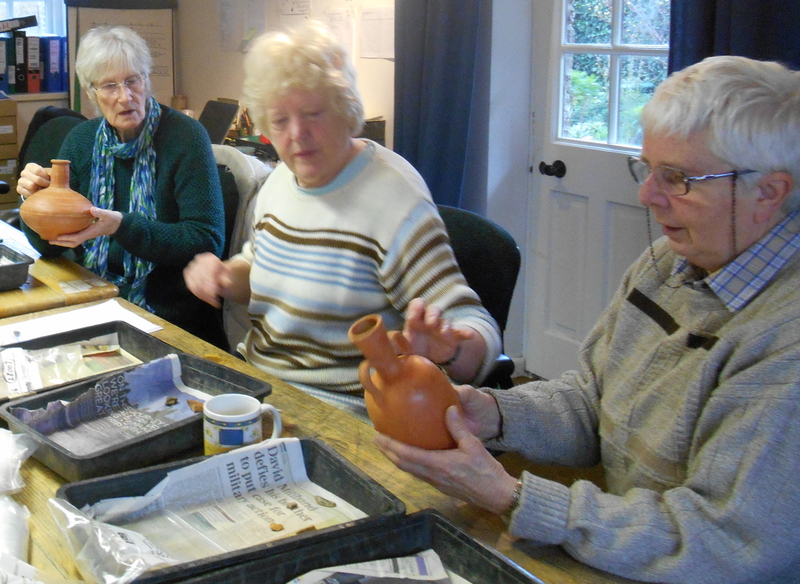 Jane spent the day with us in the pottery sorting work-room at Manor Farm and supervised a refresher pottery identification workshop. After a really interesting talk about the arrival of both the technology (and possibly some actual potters) and the products of proper wheel-thrown vessels into early Roman Britain, she showed us some samples of various regional British Roman fabric types. 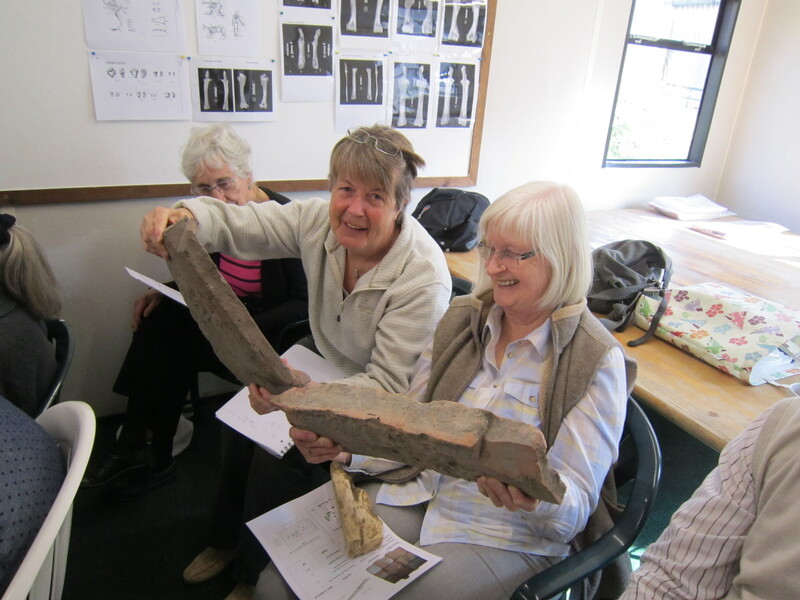 We showed her the range of Roman pottery fabric types our volunteer group has added to our Marcham pottery fabric reference collection over the last few months, and she was able to identify the kiln groups for them. The volunteers were particularly interested in her views on some usual 1st c. A.D pottery fabrics we had identified from the top layers of an unusual barrel-shaped enclosure, located just to the south of the temple and temenos complex. These turned out to include a few sherds of some rare high-status glazed Gaulish imported vessels (dated 40-60 A.D.) and a collection of fine decorated greywares showing a range of unusual barbotine applied dots and lines and swirls, early stamps and very elaborate incised designs, that Jane suspects may have derived from a local early pottery workshop that seems to pre-date the huge Oxford-centred Roman pottery industry that developed later in the region. It was a very enjoyable and productive day and the only disappointment for our team was Jane having to correct us on one of our more excitable identification sessions, where we had thought we had found a design called “raspberry roundels” found on early 1st c. Lyons vessels. Ours was very similar, but a copy-cat British version with the less delicious-sounding name of “applied barbotine dot panels”! You can’t win them all and the pottery group will continue to strive to identify as many fabric types that sound like a luxury M& S biscuit as we can! 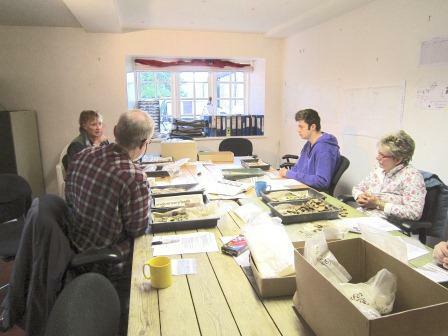 Peter Warry brought samples of Roman tegulae or roof tile and research documents to present his findings to the volunteers participating in pottery identification and analysis of animal bone from the Marcham excavations. 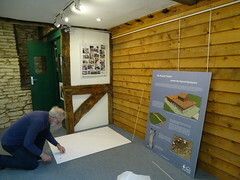 Peter encountered a problem over 10 years ago finding data on the vast quantities of roof tile dug out of trenches and dumped on spoil heaps, seemingly without further thought to its own story and how it might contribute to the interpretation of the life and time of the site under excavation. 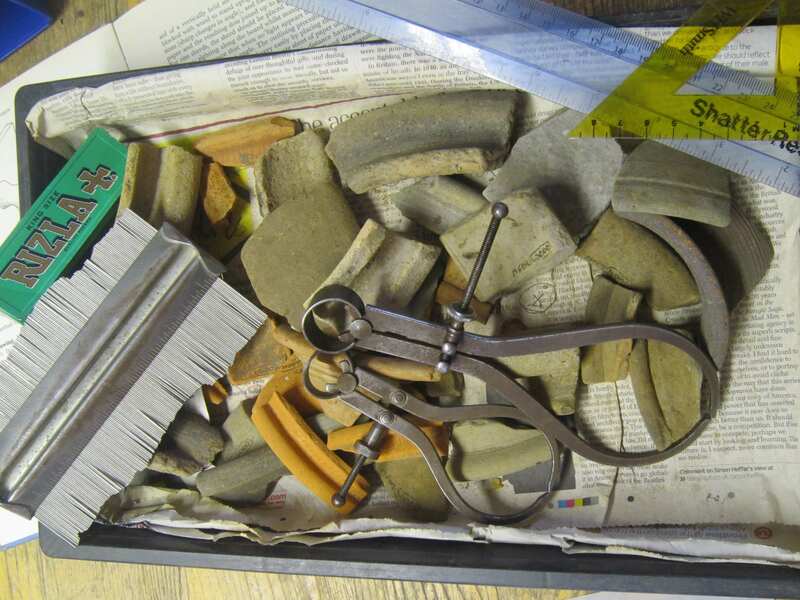 So not to be deterred, Peter spent a few years on spoil heaps and working with the Directorate at Marcham, Silchester and York sites, to name but a few, to identify and classify tegulae in the context of the excavation stratigraphy. Unlike pottery where inclusions in the clay, production methods for specific usage and possible trade routes are interesting evidence, the clay used for tile making was unadulterated local material and as such is of interest but not likely to contribute to the typology. So where to next? Peter amassed a great deal of tile sherds and noticed that during the production stage there are notches cut into the top and bottom of the clay so each tile would rest securely on the tile above and below on a typical 30 degree roof angle. 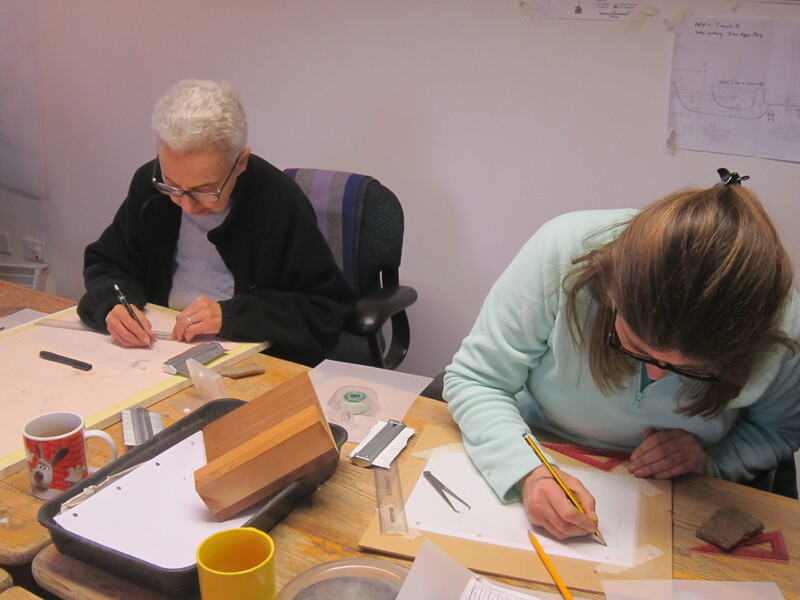 On a closer look, Peter identified four cutting styles; some cut by hand and others seemed to be moulded. Did the Romans bring the production skills with them in the second century and did the production methods change over time? Peter researched Roman military establishments and villas on the Continent which suggested the tegulae production style travelled with the invaders and also noted that tiles made for civic buildings were of a higher specification than tiles produced for villas and other general buildings. Which of the notch style came first and last? The huge trench at Roman Silchester in Hampshire, was the perfect excavation site to measure the recovery of tile sherds to examine layer by layer over the seasons between 1997 and 2004 so gave Peter the date range of style A, as he called it, up to AD 120, style B between AD 100-180, style C, AD 140-260 and style D onwards from AD 240. Peter then observed that the earlier tiles had straight parallel flanges and concluded that they would have been made by pushing the clay into a mould and smoothing the top with a ‘cheese’ wire and then cutting the notches by hand. A change in production occurred in the third century AD with the introduction of a negative mould so the top of the tile is at the bottom of the mould and by building in a notch shape into the mould it was quicker to produce. From kiln evidence on military sites Peter deduced that they would have produced their own tiles. 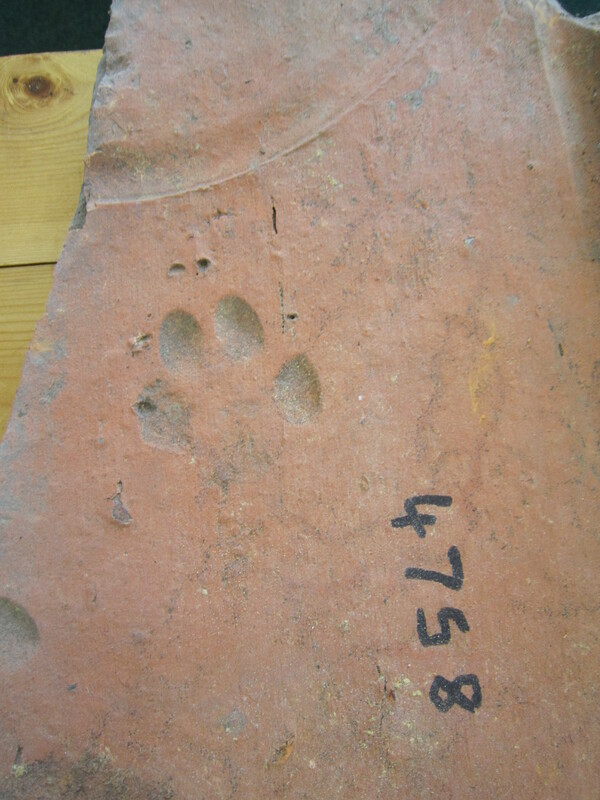 Tiles for civilian use were often made on farms and may have been franchised from evidence of makers initials stamped into the clay. Tile production would have been an all year round activity and Peter worked out that it would have taken 14 people to quarry, move the clay and form the tegulae. During the dryer months between May and September it took 14 days to load the kiln, fire and unpack the tiles. Timber to fire the kiln would be gathered during the winter months. To have your roof tiled was a status symbol and the makers made finger patterns on the corner of each tile before firing. However on someone’s roof there was an addition of dog paw prints. On the Marcham site, Peter suggests there is no evidence of buildings with roof tiles but a 3rd-4th century scatter could have been a ritual deposit with coins and pottery, particularly in Trench 2, the cruciform building. However the Temple had good evidence for a tiled roof which survived after the building fell into disuse. 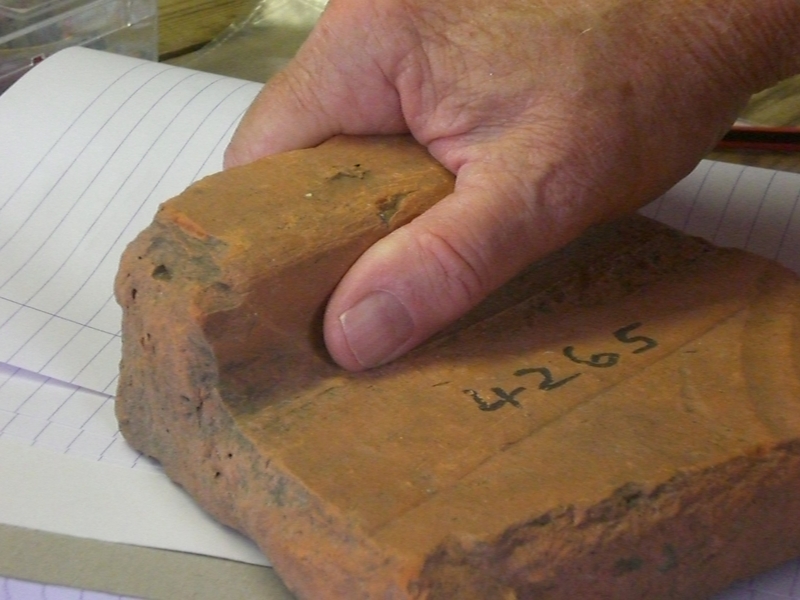 If you would like to find out more about Roman tile, Peter’s research is published as – Tegulae: Manufacture, typology and use in Roman Britain. 2006 BAR British Series 417. Archaeopress, Oxford. 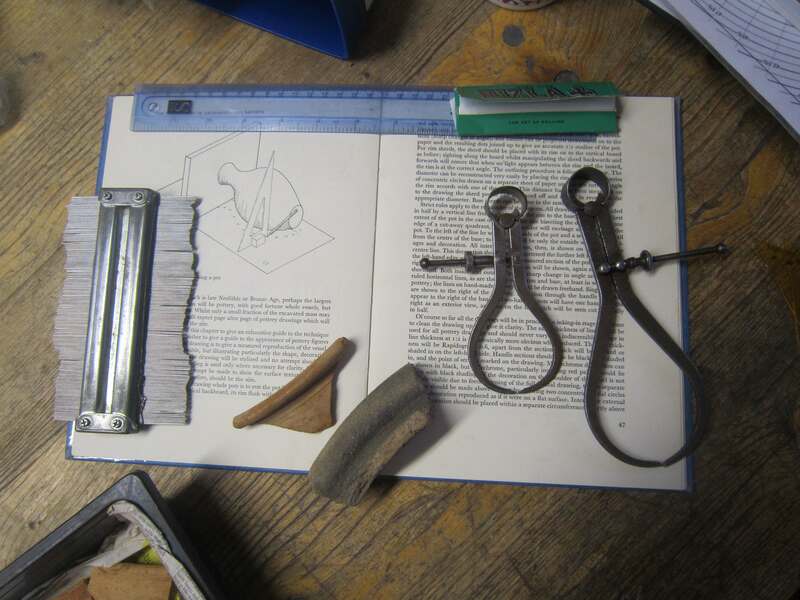 Janice described the number of different uses which fired clay was put to in the Iron Age and Roman period. Fired clay artefacts are often overlooked by archaeologists in favour of the better known fired clay item ‘pottery’. Janice had studied the salt making industry in the Iron Age and Roman period and described the process and the unique clay vessels associated with salt called ‘briquetage’. This material is rare in Oxfordshire, but during post excavation work on the Marcham assemblage a fragment of briquetage, from Droitwich in Worcestershire, had been found which showed that salt was being traded to the Marcham site. 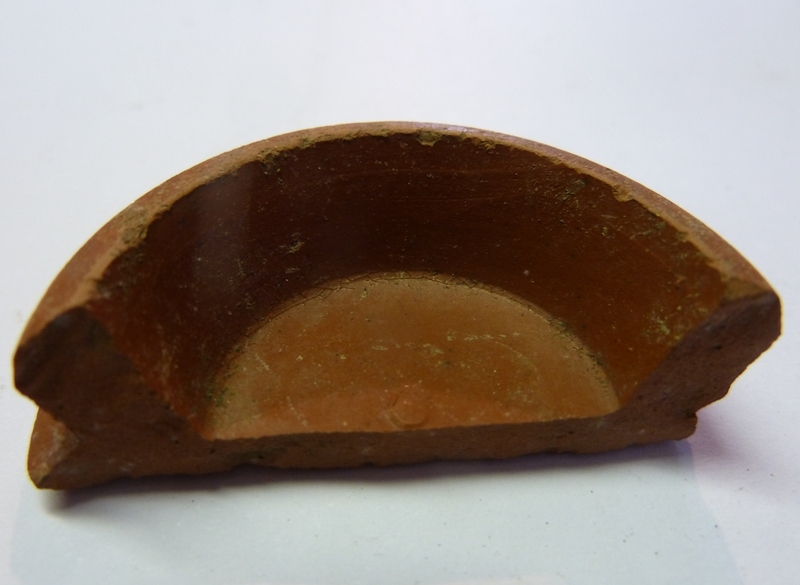 A fired clay crucible was also included in the assemblage showing that objects such as brooches and pins were being cast in copper alloy at the site and probably sold to those visiting the temple. Interestingly these crude vessels, which are handmade and fired in a clamp, are discarded after use as the residual impurities remain adhered to the clay rendering the crucibles unusable for further castings. Burnt daub has been found at Marcham although this has been accidently fired due to fire destruction. The burnt clay retains the pattern of the wattle core which would have burnt out in any fire. This gives the archaeologists an indication of another type of building on the site apart from the stone and mortar buildings which would not have survived if they had not caught fire. This was another way where fired clay adds to the picture of how people were living at Marcham nearly two thousand years ago. 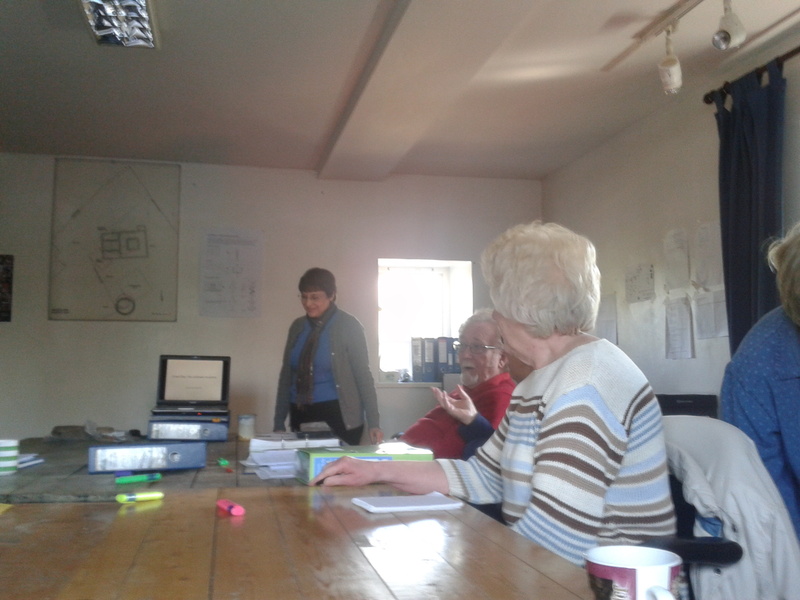 Janice’s enthusiasm for this subject was quickly seen by the group who asked a number of challenging questions. The importance and wide range of fired clay uses shows how these often ‘unloved’ objects contribute to our knowledge of the past. We previously reported that we found some “Pre-Flavian Wares” that we thought might have come from Lyons with the Roman Army in the first century AD. 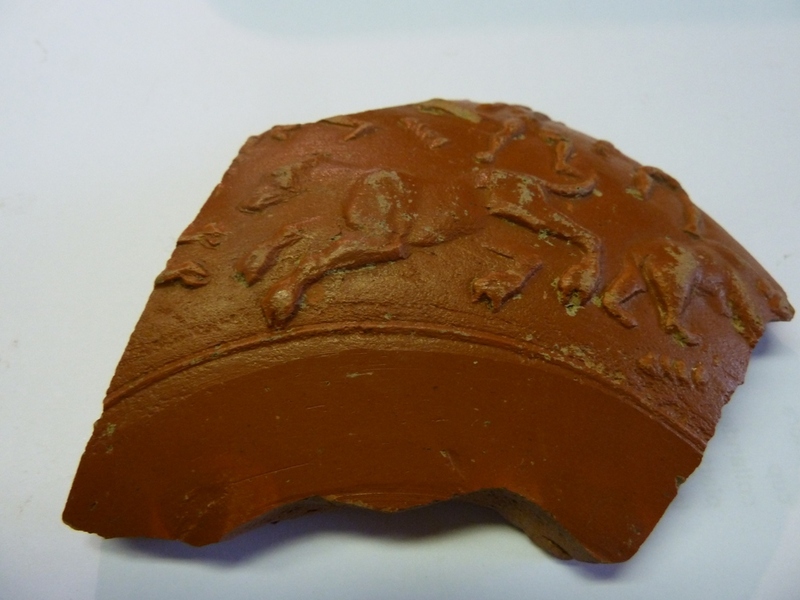 From Trendles we find quantities of Samian ware too, (terra sigillata), a fine decorated tableware also made in France or even further afield in the Roman Empire. It has a brilliant glaze-like shine, with a colour range from pale orange to bright red. There are intricate images in relief and they often carry a maker’s stamp which can sometimes be traced to its origin. This gives us an insight into the extensive trade routes and the long journey that this pottery must have made on its way to Marcham.